Sanna Helena Berger (b. Sweden, lives in London and Berlin) works predominately with relational and/or site-specific installation, text and performance. Berger’s works are often participatory, relying on the audience and their social labor as a vital component in her installations. These range from domestic environments to sculptural settings that include minimal performative elements. Berger accentuates our attention to situations which allows the interpretative discourse to linger post-appreciation with the viewer, rather than as a singular truth presented as artwork. The space in which we view and experience art is essential to Berger’s method of commentary, often as a critique of the pseudo-institutional gallery space posing as public space. When working with performance Berger utilises the actor as a presence strengthening the commentary of the situation. This presence is not always made clear as a performative element allowing the viewer the option to question and interpret this role. 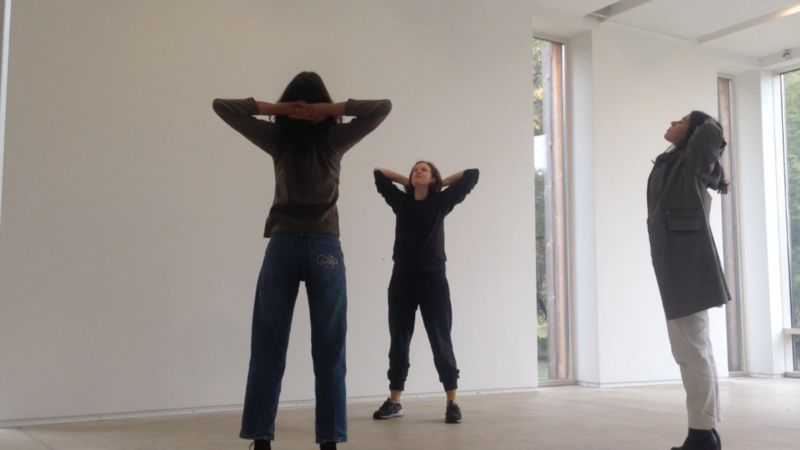 During her residency at Rupert she worked primarily with a participatory performance called ‘The foundation is a body’. The choreographed movement sequence was based on research of non-verbal communication of power via postures as performance. The sequence was performed routinely one on one together with curator Maya Tounta, with staff and residents at Rupert as well as large group sessions on the ground of Rupert. The sequence was also performed with a number of participants online, remote from Vilnius as well as invited to be the first work shown at Jasmine Picot-Chapman’s space “All Welcome” which has since become an active project-space in Vilnius. The instructed choreography has since been invited to be performed as workshops at Malmö Konsthögskola, Academy of Fine Arts, Malmö, and UDK, Academy of Fine Arts, Berlin.